You want results and you want them now. You are hard-working and committed to doing what it takes to get the results you want as fast as possible. However in an attempt to speed up their progress, many people in your situation make two critical mistakes that end up slowing down or stopping their progress. Let’s look at how not to make these mistakes and how to accelerate your results. Because we live in a world of microwaves, text messaging, drive-thurs and instant downloads, we are not used to waiting for anything. However, when it comes to making changes with your body, things take time. It takes time to improve performance, grow muscle tissue and metabolize fat. Impatience is a progress-killer. Getting instant results with your body only exists in the world of fitness marketing. Many people start a training program on Monday and then wonder on Tuesday why it is not working and by Wednesday are off in search of a next miracle special program or start making mistake #2. Others in a desperate attempt to get better add more exercises to their programs. They rationalize that if some is good, more must be better. Unfortunately, this can take a good program and make it a horrible program. As a human being, you have limited time and energy. You also have a limited amount of stress that your body can handle. By adding more exercises you risk taking time and energy away from the things that are most important to your goals. This includes not only training, but also sleeping, resting, healthy eating and staying on top of your other responsibilities – so you have time to consistently do everything I just mentioned. You also make it hard for your body to recover. While exercise is usually considered a good stress, doing too much can quickly make it a bad stress that ends up hurting and not helping you. Another problem with doing more is that while there are thousands of exercises on YouTube, there are only a small handful of amazing exercises that will deliver the results you want. The more exercises you add, the greater proportion of inferior exercises you end up with in your training program. This addition of inferior exercises makes your training progressively less efficient and slows down your results. Step 4: Spend the time you would spend doing those extra exercises on recovery and better nutrition – the better your recover, the faster your results! Let’s say you came to me and told me you wanted to improve sport performance, lose fat, gain muscle or simply wanted to train in a very time-efficient manner. After we set up a more specific goal (step 1), I would likely give you squats in your training program (step 2) as it is one of the best exercises to reach any of these goals. At this point, many people either look for a different program (after all it can’t be that simple) or look at what other leg exercises they can add. They think that if a program with squats is good, than adding 5 other leg exercises to the program will make it 5 times as good – right? The reality is that doing squats does not get you results. Rather, it is getting better at doing squats that actually helps you build muscle, burn fat and/or improve performance. Therefore the focus on your training to reach your goal should be on getting better at squats (i.e. progressively adding weight while maintain proper form and depth). We all want to get the best and fastest results possible. Make sure you are doing the right things in the gym. Once this is in order, spend the extra time that most people spend adding inferior exercises to their programs on better nutrition and improved recovery. Then, sit back and enjoy getting your results faster than ever! 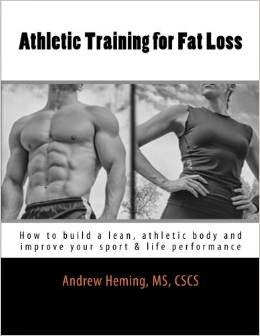 Stay tuned as next time we’ll look at more details on how to accelerate your fat loss results. Then, after that we’ll look at muscle gain.